Mix the semolina with the icing sugar and custard powder. Add the Egg Replacer or Aquafaba or lightly beat the egg white and mix into the dry ingredients along with the flavouring until you get a firm paste. 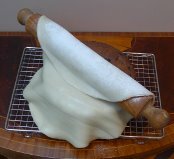 Dust the work surface and rolling pin with sifted icing sugar and roll out. 1 Almond essence is made using artificial flavourings and does not contain nuts. (But check the label to make absolutely sure). Almond extract is a pure, natural product made from the oil of bitter almonds and should not be used if you’re avoiding nuts. 2 Wrap and store unrolled Nut-free Marzipan in clingfilm to prevent it drying out until ready to use.